Highway 57, callin’ me home, no matter how far I may roam. In my youth, I did Pump Boys and Dinettes a number of times. Audiences never really knew what it was about until they entered the theatre, but they always got on board and loved it. We used to call it the best show nobody has ever heard of. Somehow, it just gets into the hearts of the people who see it. Written by its original cast members John Foley, Mark Hardwick, Debra Monk, Cass Morgan, John Schimmel and Jim Wann, it’s got a silly but highly entertaining plot, and the songs go from boot tappin’ to heartfelt with ease. And the current production tearing the roof off at Papermill Playhouse is no exception. A simple, yet highly effective set, beautifully executed by Michael Schweikardt, sets the tone for the show. One side a gas station, the other the Double Cupp Diner (Sunday breakfast, 6-11). Especially effective is the second level of the gas station where Jim was able to have his own private moment, singing about his Mamaw (more on that later). And the costumes, created with a wonderfully keen eye by Broadway’s Brian Hemesath, are authentically made with a playful wink (like the fun switch the ladies had into bathing suits). Director John Foley creates some truly memorable and unique moments and choreographer JoAnn M. Hunter gets those toes a tappin’ and creates a world that beautifully complements the actors. Other than that, this show’s success is left up to the performers, and boy, do they deliver. Starting with the Double Cupp sisters, Alysha Umphress and Julie Foldesi are a dream team. Their harmonies so flawlessly blend into one another that I had to really focus in to see who was singing what line. Their voices are perfectly suited to the style of the show and each have their moments to shine. Their duets, most notably “Menu Song” and “Tips” — hilariously directed and choreographed with pointed sexual innuendo by Foley and Hunter — are highlights. Foldesi plays every single instrument known to man. She straps on a guitar and sings a gorgeous rendition of “Best Man,” the best I’ve ever heard, in fact. Her voice fits the song like a glove, as if it was created just for her. Then, she picks up an accordion, plays that, whips out a cow bell, plays that, jams on a harmonica, then goes back to the diner and plays the pots and pans. I half expected her to whip out a ukulele. Throughout it all, she was luminous. Umpress, the powerhouse co-star of On The Town, brings down the house with her pristine rendition of “Be Good Or Be Gone”. She also starts off a gorgeous acapella rendition of “Vacation,” and truly makes it her own. She is incredibly funny and has such a gift of comic timing. Her delivery is off the cuff, with her dry wit. Both ladies, in fact, display crack jack timing. It’s easy to see why the pump boys have such an affection for them. James Barry, who plays Jim and is basically our host for the evening, is about as personable and likable as they come. He’s the perfect man for the job. The dynamic between he and Umpress is supremely funny and engaging. And his rendition of the aforementioned “Mamaw” shifts to a softer side of the character, which Barry plays and sings beautifully. Barry is joined by Gabe Bowling, the sexiest of the lot, who tears it up, literally and figuratively, on his fabulous breakout solo “Mona”. He also has charisma to spare. Sam Weber as Eddie is a standout providing backup and truly phenomenal feats with his double bass. He’s so good, in fact, that one would wish he had a solo to show off even more. And rounding out the group is Jason Ostrowski, who has a Clark Kent quality about him. He’s shy and reserved, with horn-rimmed glasses. He doesn’t say much throughout, but when he does, he lets loose on the piano, the vocals, and sets the keys (and stage) ablaze. His Act Two song, “T.N.D.P.W.A.M.” is exceptional. The boys are the perfect foil for the ladies. They too display truly superior harmonies that intertwine flawlessly in every number, especially “Takin’ It Slow” and “Fisherman’s Prayer”. In fact, it must be pointed out that Mr. Foley, also serving double duty as music director, creates a stellar sound from his cast. I was incredibly impressed at how the back-up harmonies never once outshone the soloist. There was such control with every vocal moment while carrying it off with ease. No small feat indeed. So, why not jump in Uncle Bob’s winnebago and head on down to the Paper Mill Playhouse. Aside from the chance of getting a Christmas car air freshener out of it, you’ll be able to witness six truly gifted performers show you a rockin good time. 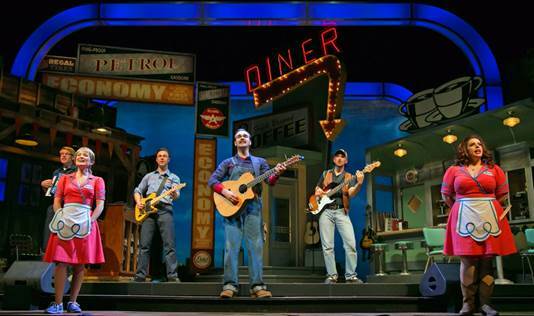 Pump Boys and Dinettes runs through May 1. For more information and tickets. click here.